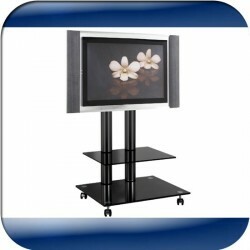 Stylish Flat Panel TV Stand(TVS4) where TV is mounted to the vertical mast of the stand. 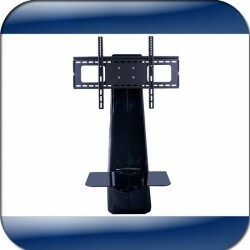 Maximum weight of the TV is 65Kg and 8mm and 6mm thick tempered black glasses for shelves. Ergonomically designed, 3 adjustable heights to suit when people are seated on a couch. 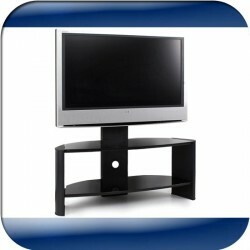 Strong TV Stand(TVS5) maximum weight of the TV is 80Kg. Comes with 10 and 8mm thick tempered black glasses for shelves. Elegant silver colour aluminium legs and black glass shelves with bevel edges. These shelving glasses are tempered to increase the strength up to 5 times the normal glass. New design for TV Stand(TVS7). Frame is screwed to the wall and elegant polymer cover hides frame and all the cables. DVD player stays on the glass shelve. Maximum weight of the TV is 60Kg and maximum load on the shelve is 30Kg. Black colour design. New design for TV Stand(TVS6). Frame is screwed to the wall and elegant polymer cover hides frame and all the cables. DVD player stays on the glass shelve. Maximum weight of the TV is 60Kg and maximum load on the shelve is 30Kg. Gray colour design. 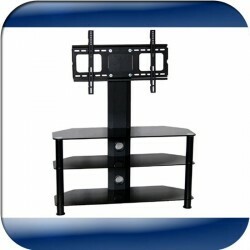 Flat Panel TV Stand with comes three shelves. TV is mounted to the vertical mast of the stand. Maximum weight of the TV is 40Kg. Three glass shelves are 8mm, 6mm and 6mm thick. 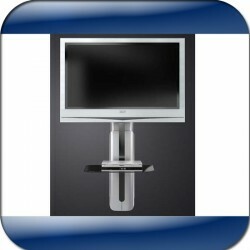 Swivel bracket for different angles to turn the TV both sides. This TV stand is best fits to corner of the room. Flat Panel TV Stand with comes two shelves. TV is mounted to the vertical mast of the stand. 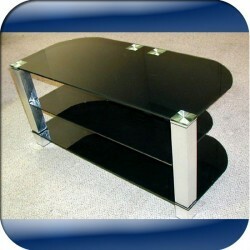 This is a strong TV stand with maximum weight of the TV is 60Kg. Two glass 6mm and 6mm thick. This TV stand is completely mobile with casters. 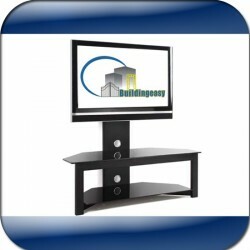 Flat Panel TV Stand with comes two shelves. TV is mounted to the vertical mast of the stand. Maximum weight of the TV is 40Kg. Extra thick 10mm bottom glass and 8mm thick top glass.